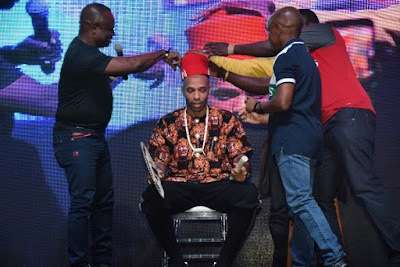 Arsenal legendary footballer, Thierry Henry, was on Sunday crowned the ‘Igwe of football’ at an event in Victoria Island, Lagos. The Frenchman is in Nigeria for ‘Watch a Match with Thierry Henry’, an event put together by Guinness Fanzone. Apart from receiving the honorary title, Henry also partook in the cooking of jollof rice. Henry later recognised and praised a one-legged footballer whom he described as “the real Igwe”. The one-legged footballer told Henry that despite losing his leg, he relocated to Lagos and still managed to achieve his dream of playing football. Here are photos from the crowning ceremony of ‘Igwe Thierry Henry 1’.